WOW DC Unlimited Series 1 Orc Shaman- Rehgar Earthfury is insanely popular and a huge collector hit! 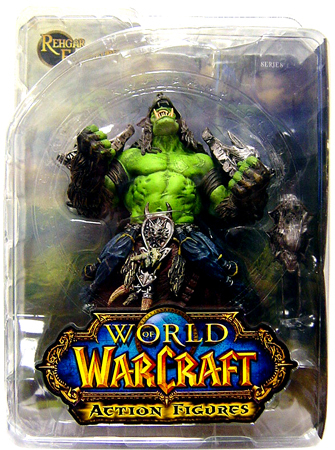 The savage, green-skinned Orcs are one of the most prolific races of Azeroth. They are commonly believed to be brutal and mindless, possessing no humanity or empathy for other races. Born on the hellish world of Draenor, the Orcs were brought into the kingdom of Stormwind through the dimensional gateway known as the Dark Portal and forced to wage war on the Humans. Tragically, the once-proud Orc clans were corrupted by the Burning Legion and used as pawns in the Legions invasion of Azeroth. The Orcs managed to rebel, however, and they were ultimately able to help turn the tide against their demon masters. Led by the young Warchief, Thrall, the Orcs have reclaimed their strength and honor. Now, the Orcs stand ready to fight not for the sake of conquest, but for their right to survive in their adopted world. 7.75&quot; high; Each figure features points of articulation. Includes additional Wolf Head accessory.This action figure is much heavier than the others. The detail is amazing. This is a BadassToys4BadassBoys.com favorite! !